The budget is the most important policy document as it lays down the priorities of the government for the coming year but also allocates funds for them. 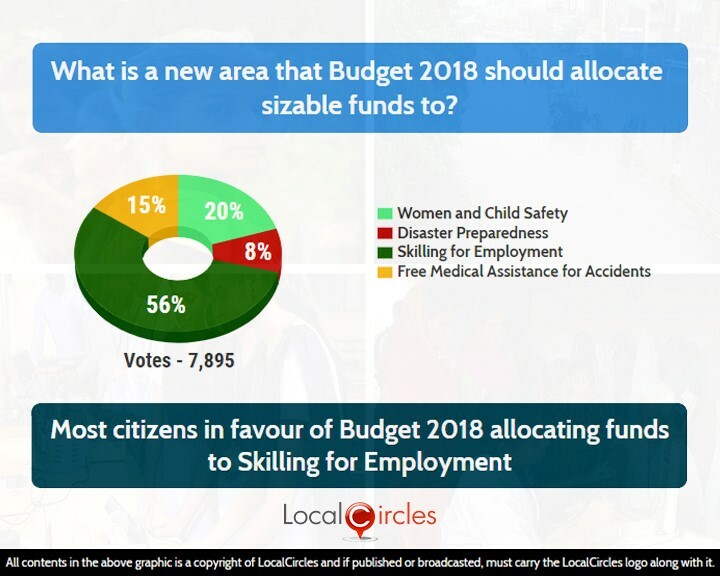 Every year for the last three years LocalCircles has been working to understand and present the citizens expectations and demands from the budget. This is done through a massive online survey in more than 200 cities. The survey covers allocation priority, direct taxation, healthcare and expenditure, including priorities for Railways, more than 125,000 votes came in on the survey. 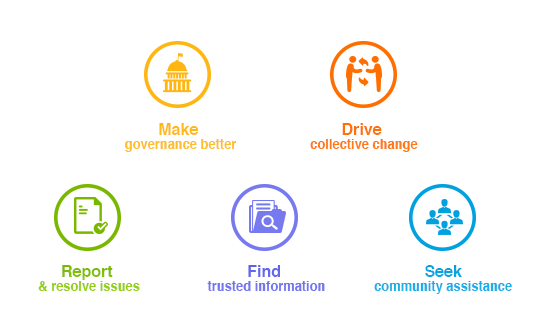 The objective is to help coalesce the citizens view which is actionable in the budget. The discussion on the budget has to move beyond taxation to more important issues like healthcare, education and ease of doing business. The budget day is an important day for the government because the attention of all the citizens is focused on it. Therefore, it is important that the government take into account what its citizens are expecting from it. 1. 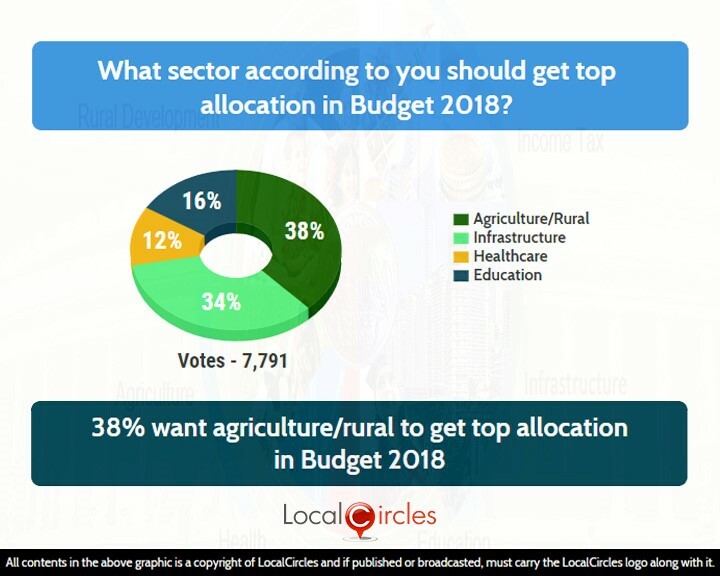 On sector wise allocation front, 38% of the citizens want agriculture to be the top priority followed by 34% who want infrastructure, 12% healthcare and 16% education. 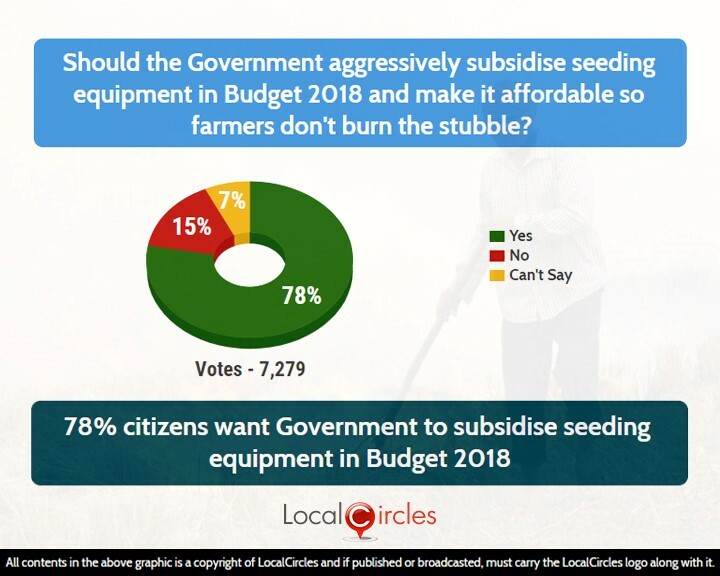 Clearly citizens feel that the agriculture being the largest employer needs more help and efforts from the government. Infrastructure is high again as it is the enabling support structure for economic growth. Central government spend on healthcare needs a serious relook as it affects every citizen in the country. 2. Most citizens want more funds to be allocated to developing skills for employment. The state of government efforts on skill development is yet to reach any kind of success and this is a crucial enabler for making youth employable. 3. 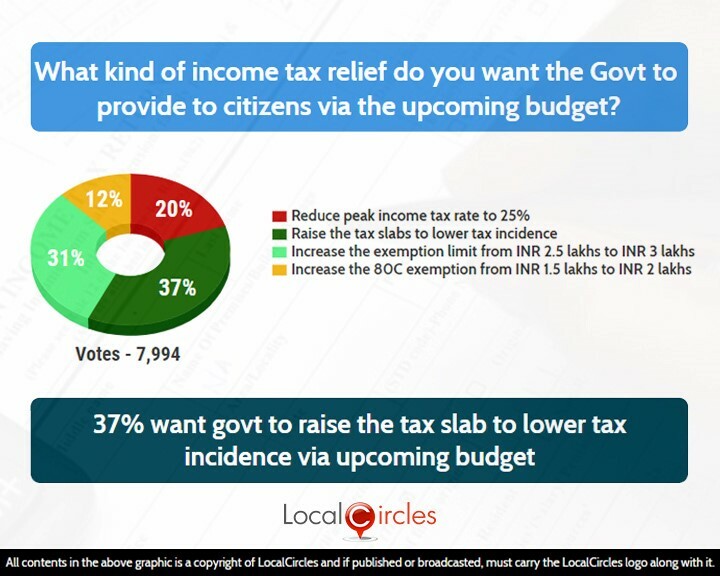 Around 37% citizens want the tax slabs to be raised to lower tax incidence, 31% want the exemption limit to be increased from INR 2.5 lakhs to INR 3 lakhs. The exemption limit has not been increased for many years and rising inflation and stagnant income means it is time to increase this limit. One of the essential tasks of the budget is to allocate the funds in a manner that economic and social targets can be met. Priority is very important as it determines not just the quantum of the funding but also gears the government machinery to put efforts behind that sector. Citizens recognize the importance of agriculture both as a component of the economy and job provider. Farmers have been witnessing fall in income leading unrest across the country. Citizens were asked which sector according to them should get top allocation in this year’s budget. 38% said it should be agriculture/rural, 34% said it should be infrastructure, 12% said healthcare while 16% said education. Around 56% citizens want sizable funds to be allocated to skilling and employment in the upcoming budget. 15% want it to be free medical assistance for accidents, 20% to women and child safety and 8% said disaster preparedness. Skill development as a crucial driver of employability in the country, and Skill India Mission is a flagship program of the government to drive this. Only 6% of the total population currently pays income tax in India. Businesses with annual revenue up to INR 50 crores are taxed at 25% and no surcharge is applicable if profit is under INR 1 crore. The general thinking has been that individual as well as corporate income tax rates are high in the country which is preventing tax receipts. Citizens have constantly been saying that the department should reduce the income tax rates and also take strong steps to ensure that more people pay income tax. 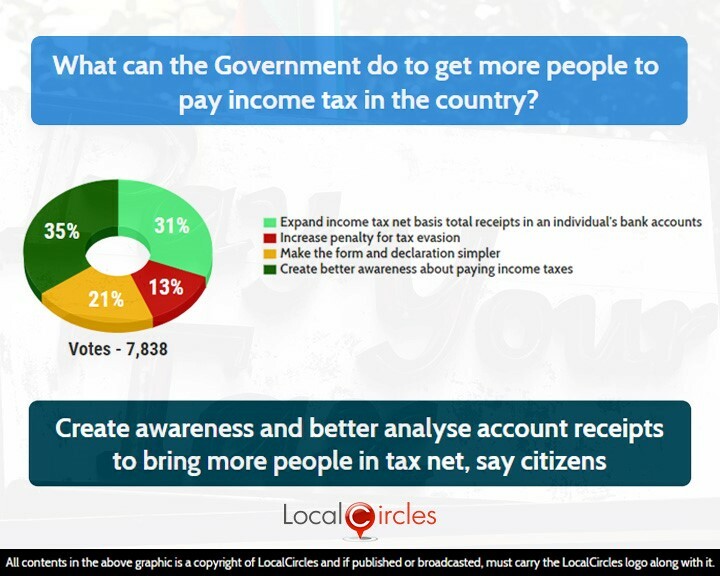 People were asked what can the Government do to get more people to pay income tax in the country. 31% said income tax net should be expanded basis total receipts in an individual's bank accounts, 13% said penalty for tax evasion should be increased, 21% said the income tax form and declaration could be simplified further and 35% said better awareness should be created about paying income taxes. 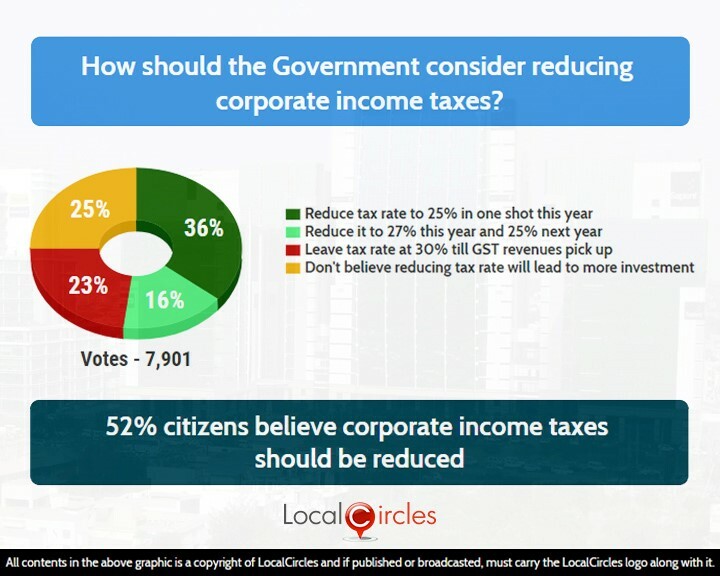 The government had expressed its intention to gradually reduce the corporate taxation rate.When asked about how should the government consider reducing corporate income taxes, 36% said it should be reduced to 25% in one stroke this year and 16% said it should be reduced to 27% this year and 25% next year. 23% said tax rate should be left at 30% till GST revenues pick up while 25% said they don’t believe reducing tax rate will lead to more investment. 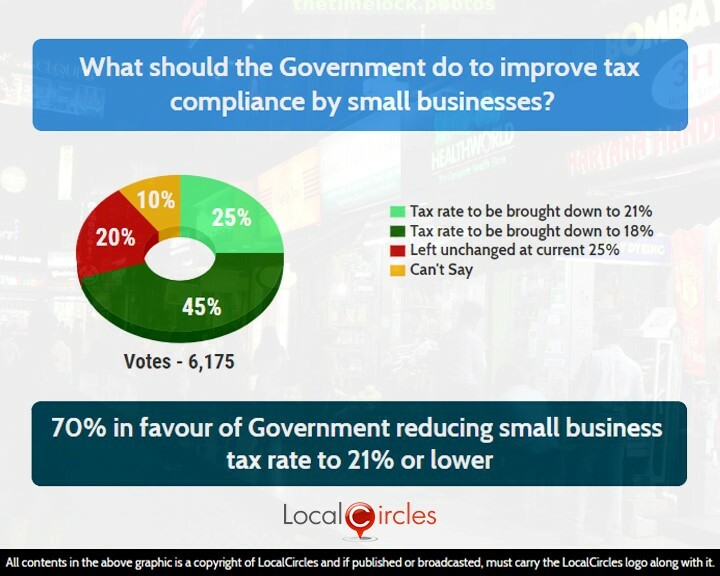 Next question asked if to improve tax compliance by millions of traders/small retailers across the country, what should be done by the Government along with stronger enforcement. 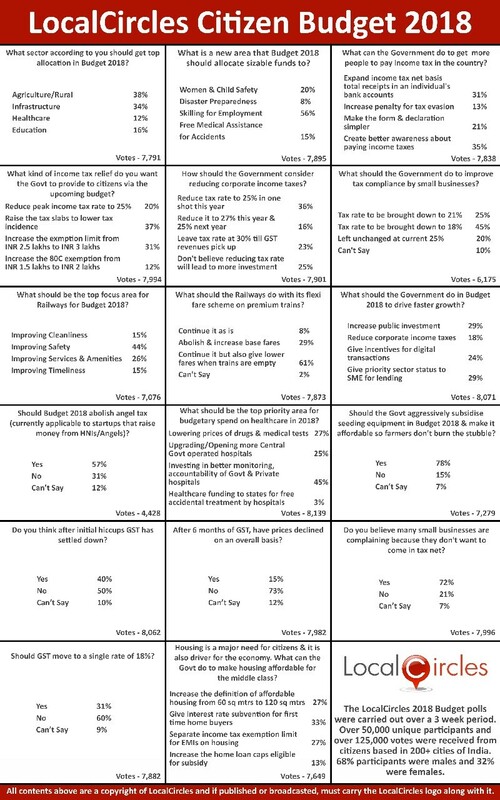 25% said tax rate should be brought down to 21% while 45% said tax rate should be brought down to 18%. 20% said it should be left unchanged at 20% and 10% were not sure about it. Last year, the Railway Budget was merged with Union Budget, as a result discussion and debate on it has reduced considerably. This does not mean that the importance of Railways has in any way reduced. Railways continues to be a government service that touches every citizen. Railways is also the country’s largest employer, it ferries lakhs of people as well as goods across the country. Being world’s 4th largest railway network, it touches the lives of almost every Indian while covering all 29 states and 7 UTs. Unlike many other countries, India does not have private railway operators hence is a monopoly of the government. 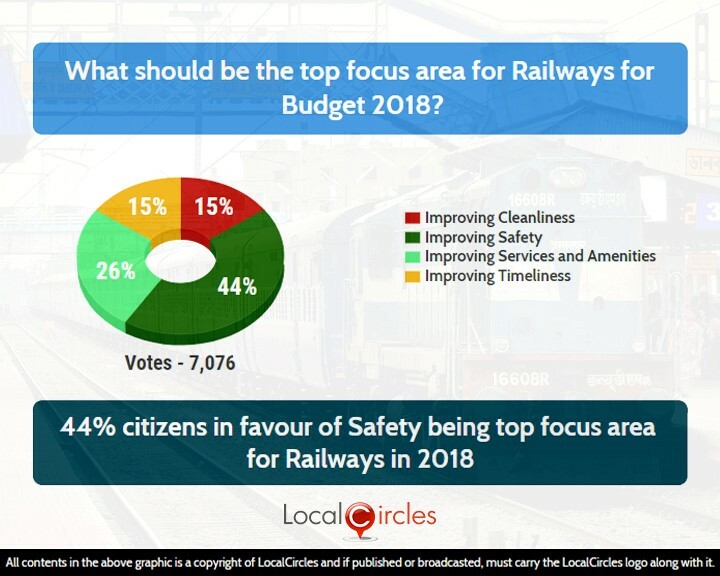 On the question what should be the top focus area for Railways for Budget 2018, 44% chose improving safety, 26% chose improving services and amenities, 15% chose improving cleanliness while 15% chose improving timeliness. The spate of accidents seems to have affected the general perception of safety in Railways hence it is being cited as the most important area. 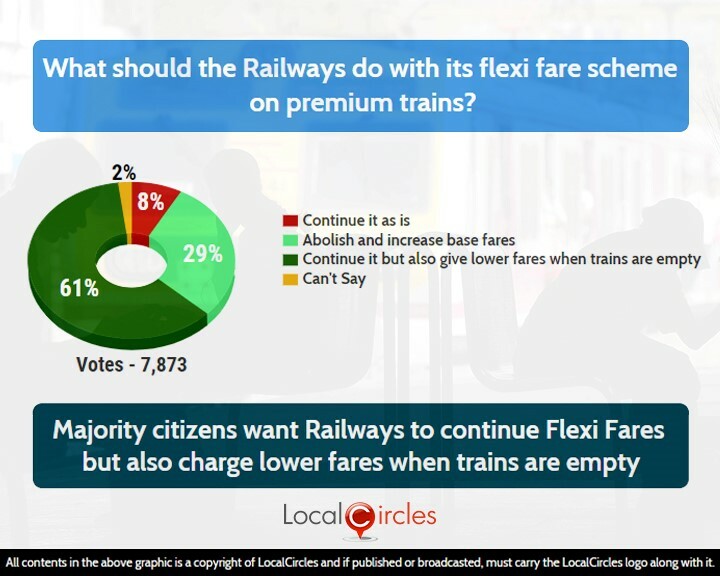 On the issue flexi fares in premium trains, around 61% citizens want it to continue but also want lower fares when trains are empty. Approximately 29% want flexi fares to be abolished and base fares increased, 8% want it to be continued as is while 2% were unsure about it. Flexi fares are followed by Railways to ensure that they are able to benefit from high demand on certain routes and thus increase its profitability. 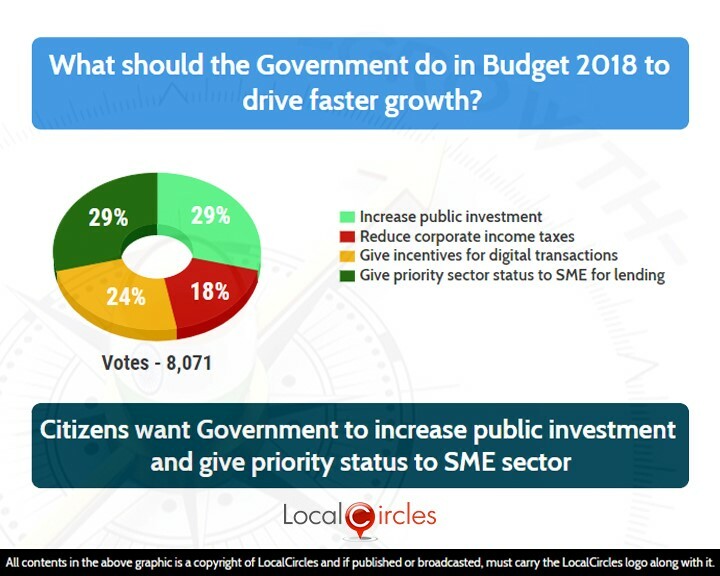 When asked what should the government do to drive faster growth in budget 2018, 29% wanted government to increase public investment, 18% want reduced corporate income taxes, 24% want incentives to be given for digital transactions and 29% want the SMEs to be given a priority sector status for lending. An ‘angel tax’ is currently applicable if a start up company receives capital from an angel or HNI based in India and the capital is raised at a value higher than the fair value of shares, then the startup becomes liable to pay 30% income tax on the capital received. Per startups, CBDT has started enforcing this and many startups are receiving notices several years later for a 30% tax liability when they have already used the capital raised. 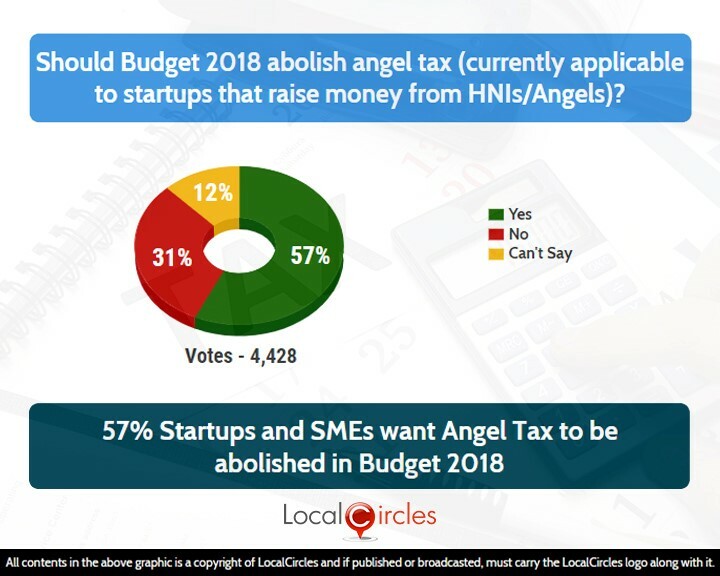 Entrepreneurs, startups and SMEs were asked if this angel tax should be abolished in the upcoming budget. 57% respondents voted in favour of it while 31% voted against it. 12% were unsure. Those who were against abolishing angel tax took that position because some HNIs/black money holders have misused it and invested in shell companies. Startups believe that a genuine start up, raising capital from a genuine investor must not be penalised for the same. Vice-President M Venkaiah Naidu recently said that making quality healthcare available to the masses in India is the most important need of the hour. He said the centre as well as the states should invest more in improving the healthcare facilities. Although the improvement in Infant Mortality Rate in India points directly towards improving healthcare services, government’s healthcare spend needs to improve. Central government contributes almost 35% of the total spend in providing healthcare services, the remaining comes from state government. Bulk of the healthcare services in the country are in the private sector hands as a result of poor investment by the government. Government’s spending on healthcare has been coming down over years with spend in last budget being about 1.2% of GDP. 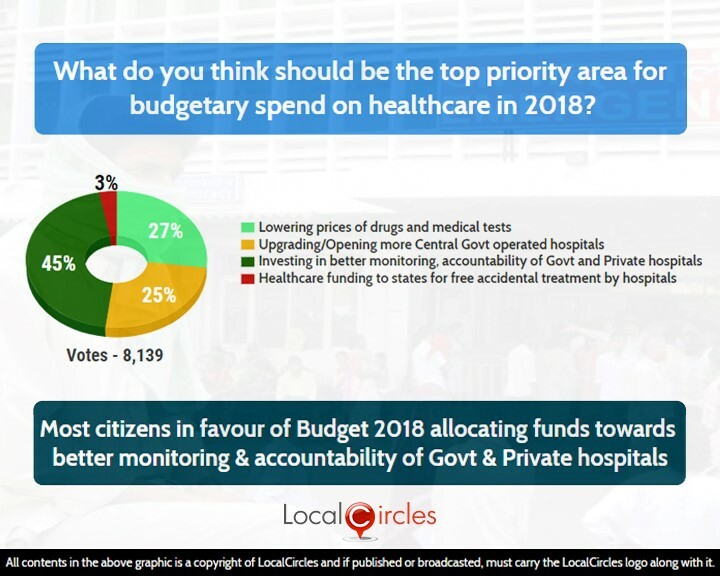 When asked what do citizens think should be the top priority area for budgetary spend within healthcare, around 27% citizens said lowering prices of drugs and medical tests, 25% wanted upgrading/opening of more central government hospitals, 45% want the government to invest in better monitoring, accountability of government & private hospitals and 3% want healthcare funding to states for free accidental treatment by hospitals. Monitoring and accountability rising due to patients facing high charges and poor quality. Every winter due to stubble burning in North India cities are covered with poisonous air a combination of high carbon particles and sulphur in the air. State government have been trying to persuade farmers not to burn stubble and cause pollution. Farmers are not changing this practice as seeding equipment that is needed for planting seeds with the stubble in the farm is very expensive. Next question was if the Government should aggressively subsidise seeding equipment in budget 2018 and make it affordable so farmers are not forced to burn the stubble. 78% agreed with it while 15% disagreed with it. 7% could not decide. This is going to be the first budget after the implementation of GST. All indirect taxes except custom duty, have now been subsumed under GST. GST has also made sure that many small businesses do not escape the tax net. The shift of items from one taxation slabs to another has caused confusion among businesses and consumers both. Moreover, there was an expectation that prices of certain products will go down as the overall rate of tax comes down due to GST. 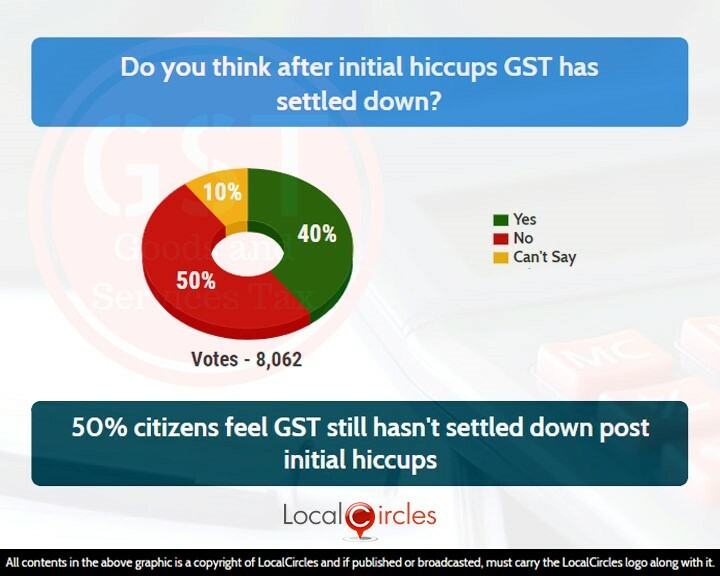 50% people think that after the initial hiccups, GST has still not settled down, whereas 40% think it indeed has settled down. 10% were unsure about it. 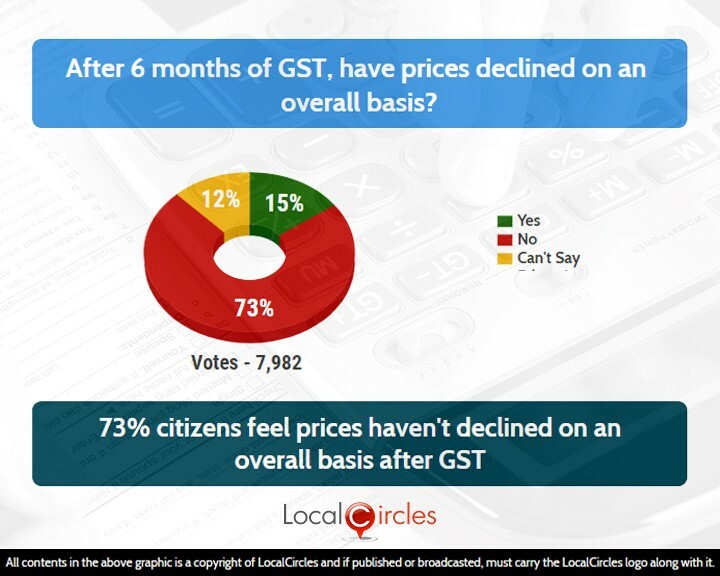 73% citizens also feel prices haven’t declined on an overall basis after the launch of GST. Only 15% feel prices have come down while 12% chose not to answer. 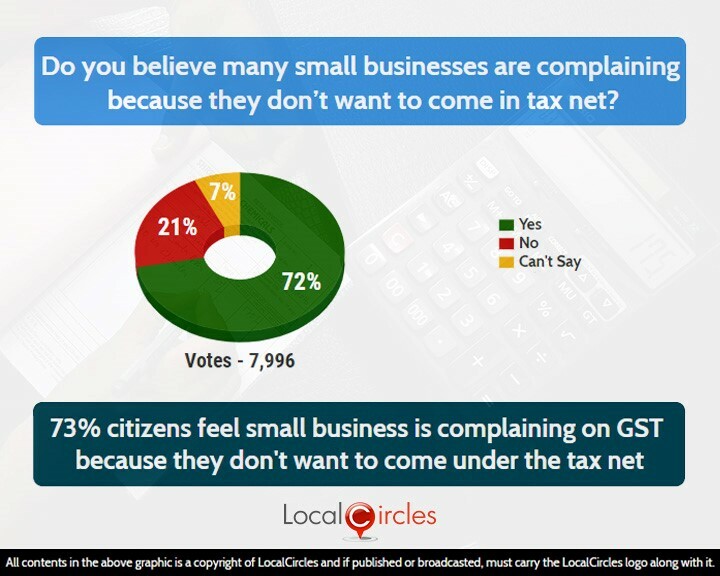 The next poll showed that 73% citizens feel that small businesses are complaining about GST as they did not want to come under the tax net. Only 21% feel it is not the case. The next poll on GST asked citizens if GST should move to a single rate of 18%. 31% agreed with it while 60% did not agree with it. Housing is a core industry and drives the economy, moreover over the last one year it has faced the brunt of the demonetization and RERA. 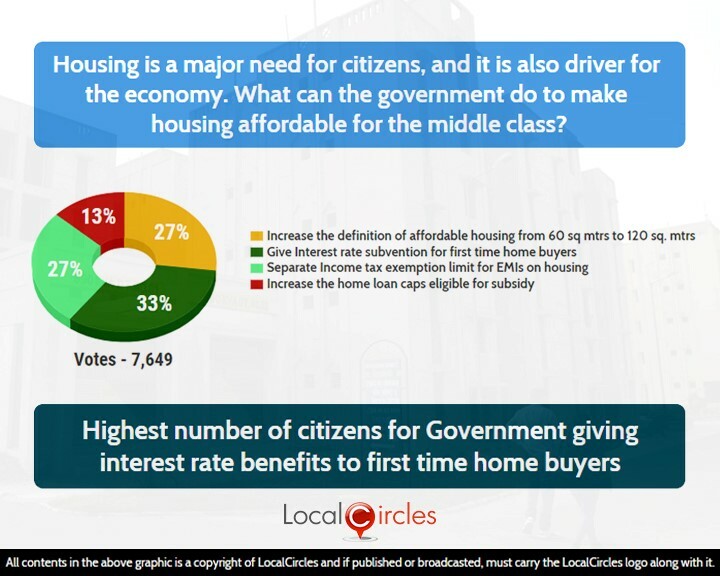 To make housing affordable for middle class, 33% citizens want the government to give interest rate subvention to first time home buyers, 27% wants separate income tax exemption limit for EMIs for housing, 13% want the home loan caps eligible for subsidy to be increased whereas 27% want government to increase the size of homes that classify as affordable housing.